The flavor of this traditional Southern potherb is improved by frost. 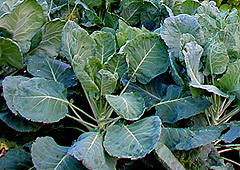 Very cold hardy (harvest can continue right through snow), collards are also among the most heat tolerant of cole crops. Prefers full sun in spring, but can benefit from light shade during hot weather. Prefers well-drained, fertile soil high in organic matter, pH 6.0 to 7.5. Can tolerate slightly alkaline soil. Prefers plentiful, consistent moisture. Can tolerate drought, but quality and flavor of leaves suffer. Some varieties have blue-green cast. As plants mature and lower leaves are harvested, plants begin to look less like a clump and start to resemble small palm trees with a cluster of leaves at the top of a long stem. frost - Flavor improved when plants are “kissed” by frost. Direct seed about three months before expected fall frost. Plant seeds � to � inch deep, 1 inch apart in rows 18 to 30 inches apart. Thin to 12- to 18-inch spacings. Eat or transplant thinnings. For spring crops, start plants inside about 8 weeks before the last frost, and transplant when they are about 6 weeks old. Set transplants 12 inches apart, rows 18 to 24 inches apart. Plant direct-seeded crops 1/2 inch deep and 3 inches apart 3 weeks before last frost. Thin to 12 to 18 inches apart. Collards don't seem to be as troubled by pests as most other cole crops. Use floating row covers to help protect from early insect infestations. Usually not as susceptible to pest damage as other cole crops. To help reduce disease, do not plant kale or other cole crops in the same location more than once every three or four years. 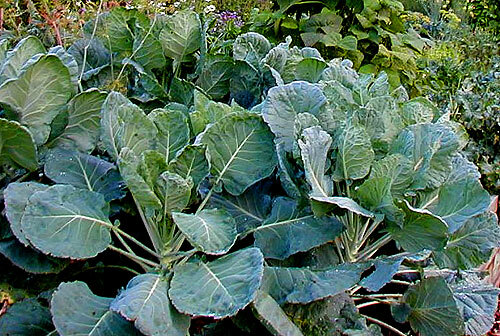 Browse collards varieties at our Vegetable Varieties for Gardeners website. Choices are usually limited in seed catalogs. Some varieties form loose heads.